Beautifully engraved certificate from the Avalon Beach Improvement Company printed (or issued!) in 1893. This historic document was printed by the W.A. Church Pr. Phil. 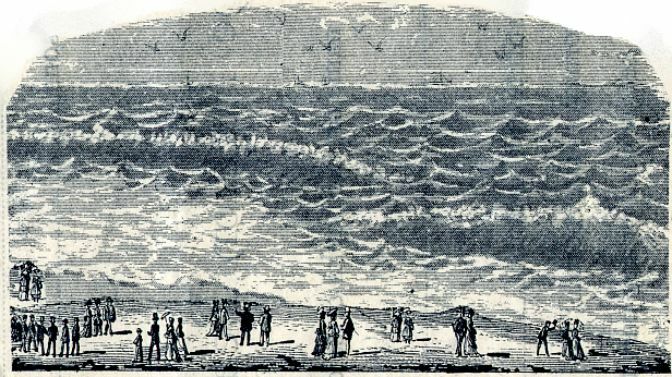 and has an ornate border around it with a vignette of men and women strolling on the beach with waves crashing the shoreline. This item has the handwritten signatures of the Company�s President, Ellwood Noecker and Treasurer, D. Weylman and is over 118 years old. 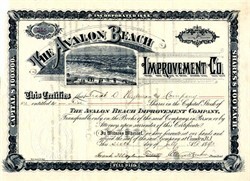 The Avalon Beach Improvement Company was formed in 1888, and a year later the Avalon Beach Hotel Company was formed.